The Hebridean Celtic Festival, or HebCeltFest, is an annual music event with an international flavour. It takes place in the town of Stornoway on the Outer Hebridean island of Lewis. This popular event attracts artists from across the globe as well as being a great place for local singers and musicians to showcase their talents. Past headliners include Van Morrison and the Levellers. Nearly 20,000 festival goers are expected for the 2018 festival which will take place in July so make sure to research and book your accommodation in Stornoway or on Lewis early. You will find a good choice of deals for B&Bs, hotels or bed and breakfast guesthouses at several spots on the island. This popular Celtic Festival was first held in 1996 and hosted a crowd of around 1,000 music lovers in its first year. 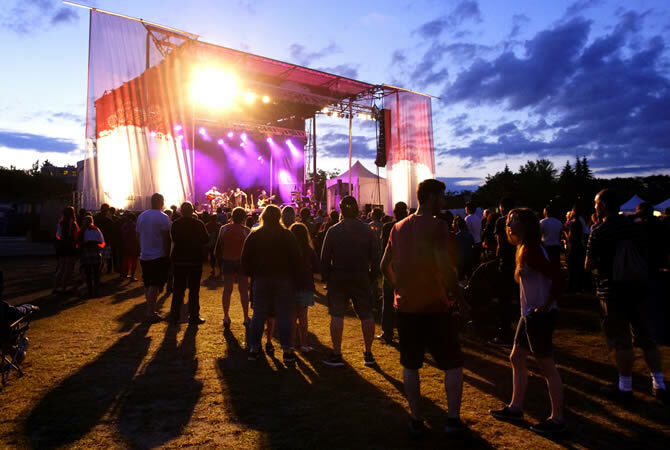 Several headlining acts have already been lined up to entertain at the 2018 HebCeltFest, including Habadekuk, The Tumbling Souls, Yves Lambert Trio, Blazin’ Fiddles, and Deacon Blue will also be putting in an appearance. Not surprisingly, accommodation on Lewis gets booked up very quickly so to ensure the best chance of getting great deals start your research now and book your cheap hotels, hostel rooms or bed and breakfasts while you can as well as make reservations for your plane or ferry tickets from the mainland. Your accommodation choices range from a campsite on the outskirts of Stornoway to highly-rated B&Bs or guesthouses, good value hostels and self-catering cottages or more luxurious hotels. The main arena for the festival will be located as usual on Castle Green in front of the ruins of Lews Castle while other events will be held in the An Lanntair Arts Centre, the Caladh Inn and other venues on the island. As well as enjoying Celtic singing and music when you head to the HebCeltFest you can also enjoy Gaelic poetry, storytelling and street art along with opportunities to take part in workshops, have a go at learning Gaelic or watch the rough and tumble of traditional shinty matches. Run by dedicated teams of volunteers, the HebCeltFest attracts visitors from across the United Kingdom and the globe and swells the population of Stornoway by half during its four days. To get the most out of the event have a look at the programme and plan your stay carefully. You will have to buy individual tickets for different shows and activities or weekend tickets can be bought for events in the main arena, the venue for the headlining acts of 2017. When you enter the arena you will be given a wristband enabling you to come and go as you wish during the gigs. You can take your own food and soft drinks into the main site or use the bar and food stands available but you are not allowed to take in your own alcohol. If you attempt to do so it will be confiscated. The dates for 2018 are the 18th to 21st of July. Celtic Music Festival at Stornoway on Lewis, in the Outer Hebrides of Scotland. Take a train to Inverness Scotland, from here you can travel by bus to Ullapool and take the ferry to Stornoway. Travel time between Inverness and Ullapool is about 1 hour and 15 minutes or less. Caledonian MacBrayne ferry company operates a number of ferries throughout the Hebrides. There are frequent daily connections in each direction between Ullapool and Stornoway. Scottish Citylink coaches number 961 operates from central Inverness to Ullapool. There are coach connections from both Glasgow and Edinburgh city centre. From here you can connect with the National Express network. Stornoway airport is served by direct flights from the mainland. Flights operated by Flybe (Loganair) and Eastern Airways connect the island with the Scottish airports of Aberdeen, Edinburgh, Glasgow and Inverness. There are also inter-island flights direct from Benbecula.